No sólo somos cereal. Somos más que cereal. El original. El Último. Lo mejor que le ha pasado al cereal desde cereal. CORN, WHOLE GRAIN WHEAT, SUGAR, WHOLE GRAIN ROLLED OATS, BROWN SUGAR, ALMONDS, RICE, CANOLA OIL, WHEAT FLOUR, MALTED BARLEY FLOUR, CORN SYRUP, SALT, WHEY (FROM MILK), MALTED CORN AND BARLEY SYRUP, WILDFLOWER HONEY, CARAMEL COLOR, CINNAMON, NATURAL AND ARTIFICIAL FLAVOR, ANNATTO EXTRACT (COLOR) ,BHT ADDED TO PACKAGING MATERIAL TO PRESERVE PRODUCT FRESHNESS. REDUCED IRON, NIACINAMIDE, VITAMIN B6, VITAMIN A PALMITATE, RIBOFLAVIN (VITAMIN B1), ZINC OXIDE (SOURCE OF ZINC), FOLIC ACID, VITAMIN B12, VITAMIN D.
CORN, WHOLE GRAIN WHEAT, SUGAR, WHOLE GRAIN ROLLED OATS, ALMONDS, RICE, CANOLA OIL, CORN SYRUP, DRIED BANANAS, SALT, BARLEY MALT EXTRACT, MOLASSES, CINNAMON, HONEY, CARAMEL COLOR, NATURAL FLAVOR, BHT ADDED TO PRESERVE FRESHNESS. FERRIC ORTHOPHOSPHATE (SOURCE OF IRON), REDUCED IRON, NIACINAMIDE (VITAMIN B3), ZINC OXIDE, THIAMIN MONONITRATE (VITAMIN B1), PYRIDOXINE HYDROCHLORIDE (VITAMIN B6), CALCIUM PANTOTHENATE (VITAMIN B5), FOLIC ACID. WHOLE GRAIN ROLLED OATS, CANE SUGAR, CANOLA OIL, RICE FLOUR, WHOLE OAT FLOUR, MOLASSES, ALMONDS, DRIED BANANAS, NATURAL FLAVOR, BARLEY MALT EXTRACT, SALT. WHOLE GRAIN ROLLED OATS, CANE SUGAR, CANOLA OIL, RICE FLOUR, CORNSTARCH, ALMONDS, HONEY, SALT, NATURAL FLAVOR, BARLEY MALT EXTRACT, CARDAMOM SEED, FENNEL SEED, FENUGREEK SEED, NUTMEG. WHOLE GRAIN ROLLED OATS, CANE SUGAR, RICE FLOUR, CANOLA OIL, MAPLE SYRUP, PECANS, SALT, BARLEY MALT EXTRACT, SPICES (CINNAMON, GINGER, CARDAMOM, PEPPER, CLOVES), NATURAL FLAVOR. MAY CONTAIN: OTHER TREE NUTS, WHEAT, SOY. MATERIAL TO PRESERVE PRODUCT FRESHNESS. THIAMIN MONONITRATE (VITAMIN B1), ZINC OXIDE (SOURCE OF ZINC), FOLIC ACID, VITAMIN B12, VITAMIN D3. WHOLE GRAIN ROLLED OATS, BROWN SUGAR, WHOLE GRAIN RICE, WHOLE GRAIN WHEAT, CANOLA OIL, CORN SYRUP, SUGAR, HONEY, CARAMEL COLOR. NIACINAMIDE, REDUCED IRON, VITAMIN A PALMITATE, ZINC OXIDE (SOURCE OF ZINC), RIBOFLAVIN (VITAMIN B2), VITAMIN B6, THIAMIN MONONITRATE (VITAMIN B1), FOLIC ACID, VITAMIN D3, VITAMIN B12. CORN, WHOLE GRAIN WHEAT, SUGAR, WHOLE GRAIN ROLLED OATS, BROWN SUGAR, RICE, DRIED STRAWBERRIES, CANOLA OIL, WHEAT FLOUR, MALTED BARLEY FLOUR, CORN SYRUP, SALT, WHEY (FROM MILK), MALTED CORN AND BARLEY SYRUP, HONEY, CARAMEL COLOR, NATURAL FLAVOR, ANNATTO EXTRACT (COLOR). BHT ADDED TO PACKAGING MATERIAL TO PRESERVE PRODUCT FRESHNESS. REDUCED IRON, NIACINAMIDE, VITAMIN B6, VITAMIN A PALMITATE, RIBOFLAVIN (VITAMIN B2), THIAMIN MONONITRATE (VITAMIN B1), ZINC OXIDE (SOURCE OF ZINC), FOLIC ACID, VITAMIN B12, VITAMIN D3. CONTAINS: WHEAT, PECANS, AND MILK. CORN, WHOLE GRAIN WHEAT, SUGAR, WHOLE GRAIN ROLLED OATS, BROWN SUGAR, RICE, CANOLA OIL, WHEAT FLOUR, MALTED BARLEY FLOUR, CORN SYRUP, CINNAMON, SALT, WHEY (FROM MILK), MALTED CORN AND BARLEY SYRUP, HONEY, NATURAL AND ARTIFICIAL FLAVOR, ANNATTO EXTRACT (COLOR). BHT ADDED TO PACKAGING MATERIAL TO PRESERVE PRODUCT FRESHNESS. CORN, WHOLE GRAIN WHEAT, SUGAR, WHOLE GRAIN ROLLED OATS, RICE, DRIED APPLES, CANOLA OIL, WHEAT FLOUR, MALTED BARLEY FLOUR, CINNAMON, CORN SYRUP, SALT, MOLASSES, HONEY, BARLEY MALT EXTRACT, NATURAL FLAVOR. BHT ADDED TO PRESERVE FRESHNESS. REDUCED IRON, NIACINAMIDE (VITAMIN B3), ZINC OXIDE, THIAMIN MONONITRATE (VITAMIN B1), PYRIDOXINE HYDROCHLORIDE (VITAMIN B6), FOLIC ACID. WHOLE GRAIN WHEAT, RICE, SUGAR, WHOLE GRAIN ROLLED OATS, BROWN SUGAR, CANOLA OIL, CORN SYRUP, WHEAT FLOUR, CORN MEAL, MALTED BARLEY FLOUR, SALT, WHEY (FROM MILK), HONEY, GROUND VANILLA BEANS, NATURAL FLAVOR. BHT ADDED TO PACKAGING MATERIAL TO PRESERVE PRODUCT FRESHNESS. 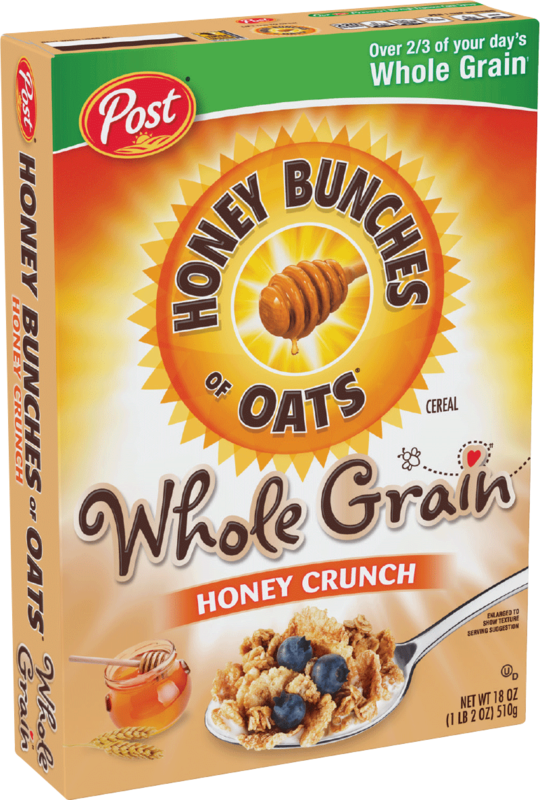 WHOLE GRAIN WHEAT, RICE, SUGAR, WHOLE GRAIN ROLLED OATS, BROWN SUGAR, CANOLA OIL, CORN SYRUP, WHEAT FLOUR, CORN MEAL, MALTED BARLEY FLOUR, SALT, WHEY (FROM MILK), HONEY, CARAMEL COLOR, NATURAL AND ARTIFICIAL FLAVOR. BHT ADDED TO PACKAGING MATERIAL TO PRESERVE PRODUCT FRESHNESS.